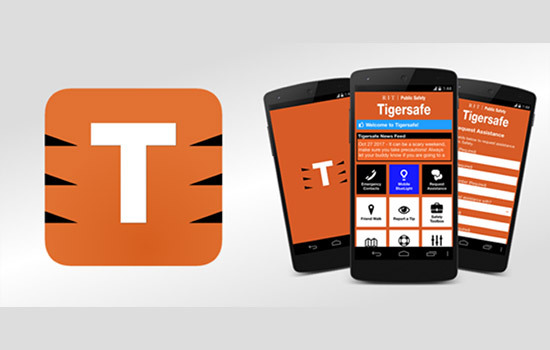 Rochester Institute of Technology’s Public Safety today has launched a new and improved RIT TigerSafe app, accessible on all smartphone devices on Apple iOS and Android platforms. The new app, which is free, also has new features and resources for students. All users need to uninstall the current version of TigerSafe and download the new version: https://apparmor.com/clients/rit.edu/. The original version of the app is no longer supported. Thousands of people in the RIT community have utilized the app in the past four years. The new app will enable students to receive push notifications in the event of an emergency on campus and provide information from Public Safety in the event of a crisis. Public Safety requests, including emergencies, acting as a mobile blue light or tip reporting. Requesting a jumpstart for your car. Real-time communication with emergency dispatch. A text option is available also. Friend walk, where your friends can watch as you walk to your destination. Yazback said users will also be able to receive a news feed from Public Safety’s Twitter account. For more information, visit the TigerSafe or RIT Public Safety Facebook pages.